For the past two years, I have been writing about the Letters of Love initiative (here and here). It is such a lovely, inspiring act that brings joy to thousands of children who could use it and yet one so simple, you and I can contribute simply by scrolling through our mobile gallery. This year, instead of writing about Letters of Love, I thought it would be better to get into the mind of the person behind it all. She was just 23 years 'old' when she decided she wanted to make a difference in the lives of children caught in between a war they did not ask for. In two years, she has got - myself included - over 15000 men, women and children from over a dozen countries to join her and show these children that they are loved. Ladies and Gentlemen, Mrs Pooja Pradeep. 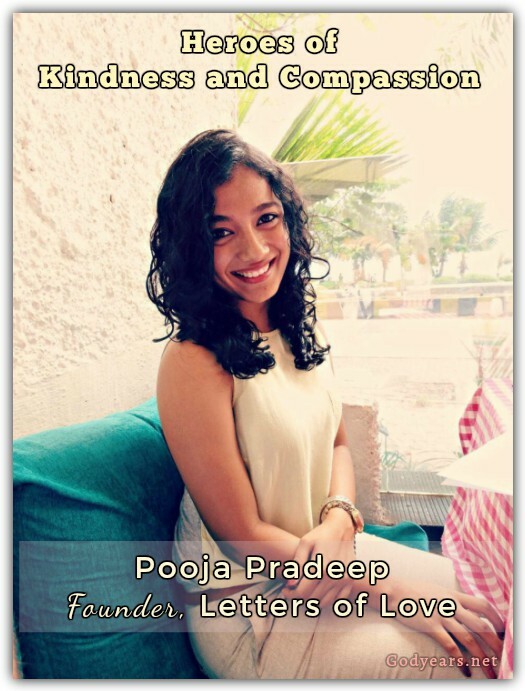 My name is Pooja Pradeep and I’m a 25 year old woman who strongly believes in love, unicorns and the power of pink and has a penchant for empowering children through sound education. Professionally, I’m a Mechanical Engineer turned Educator hailing originally from Calicut, Kerala and currently based out of Mumbai. After my brief stint as a higher secondary Physics & Math teacher, I've worked as the Chapter Director of India for The History Project, a Cambridge Social Venture that inspires critical thinking and empathy amongst students using Indo-Pak juxtaposed history as a tool, continuing as their India Representative. I'm also a Counselor at Seeds of Peace International Camp, USA, where we enable peace-building and conflict-resolution through a summer camp for teenagers from Israel, Palestine, Egypt, Jordan, India, Pakistan & the United States. And yes, I’m the Founder of Letters of Love, a global initiative under the guidance of United Nations High Commissioner for Refugees (UNHCR)-Turkey, that aspires to make a difference to the refugee crisis, one smile at a time. When I’m not doing any of the above, you will find me dancing. On the personal front, my family is the core of my existence- I have my mother’s face, my dad’s tongue and temper and I share nothing common with my sister except the fact that we have the same parents. I’m married to Rushil, who is everything I’m not and a wonderful man I am hopelessly in love with since 2010. If there’s anything I love more than these and my closest friends, it’s Biriyani. How did Letters of Love come about? For about 2 weeks, I was very troubled with lounging in my couch at home and watching the Syrian War and Refugee Crisis unfold in my TV and across all social media platforms and all I was doing was watching it, live. I followed the journey of Brandon Stanton, photoblogger of Humans Of New York, as he portrayed stories of refugees across Europe in simple photographs and excerpts of their lives. The uniqueness of each story with the underlying tone of abysmal terror pushed me to wake up with an idea one morning- to send a colourful postcard to a refugee child. I opened up a word document and typed what I had in mind, reached out to a handful of friends from around 10 countries, connected with people in the field, established a channel for the letters to flow, created a Facebook page and tadaaa- In a week’s time, Letters of Love was born. What is a Letter of Love? A Letter of Love is your happiest photograph and a warm New Year greeting, wherein the photographs will be printed out as postcards, the messages will be translated to Syrian Arabic, and those will be written down on the respective sender’s postcard, doodled and coloured. The letters are stacked until mid-December and then are couriered to our Implementation partners in Turkey, Jordan and other host countries. 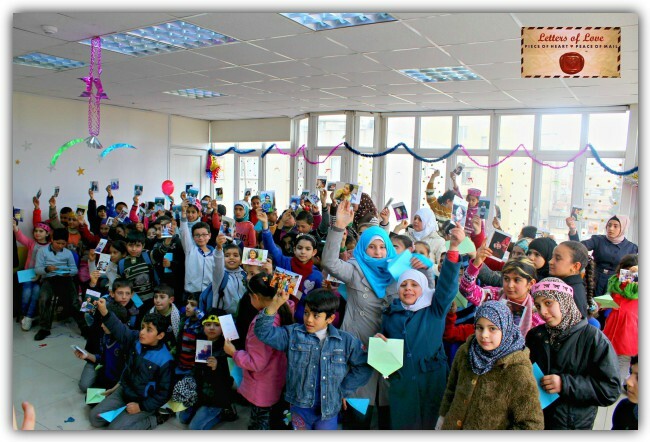 Comprising of a team of 19 across 11 countries, Letters of Love, today, is making a difference to global refugee crises by delivering hand written New Year postcards to over ten thousand Syrian, Iraqi & Yazidi refugee children in Turkey, Jordan & Lebanon, running sensitization sessions for school & university students around the world to cultivate empathy and to help each child discover their potential in bringing about societal change, and we also raise funds. 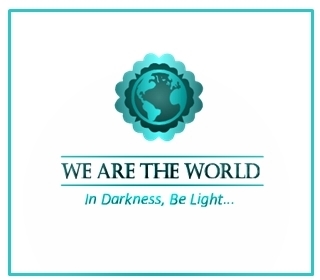 No less than the United Nations High Commissioner for Refugees is helping you in this endeavor. How did that association come about? When I first came up with the idea of helping refugee children sitting in a well-removed, far away city of Calicut in Kerala, most people dismissed it almost instantaneously. Rushil, my fiancé then, however (though as confused as the rest of the world) was inspired by my conviction and connected me with the wonderful Christopher Littlefield. Seeds of Peace is an international non profit based out of the US that focuses on peace building and conflict resolution by bringing in teenagers from conflict countries. Rushil is an Indian Seed from 2003 and Chris was his bunk counsellor. Chris, gave this idea the wings to fly by mentoring me, motivating me and connecting me with people he knew at UNHCR Turkey. They were very receptive to the idea and were more than happy to facilitate the distribution of letters at their end. How has the public response been? The first year, the tumult of criticism the idea faced was enormous. People couldn’t fathom the idea of the difference kindness in the form of a letter here could possibly make. A handful also believed it was insensitive sending these children happy colourful pictures. With the humble experiences I've had working with children as a teacher and under the guidance of UNHCR personnel, I stood my ground and requested the critics to wait for the feedback. 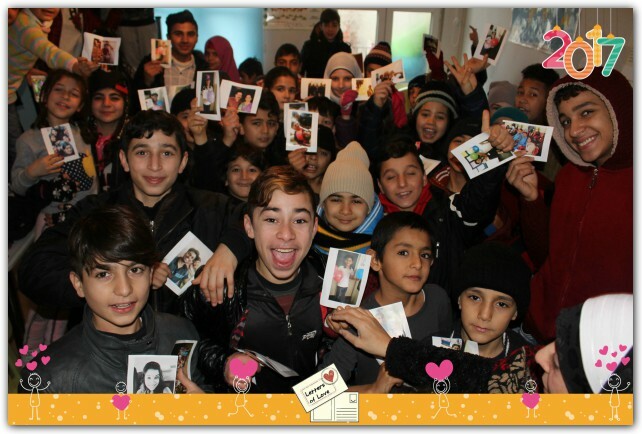 It was rewarding to see how Letters of Love in its pilot year of 2016 delivered letters to 1300 Syrian Refugee Children, thanks to the sincere and prompt efforts of UNHCR-Gaziantep, Turkey, and the 9 community centers of our implementation partners(as facilitated by UNHCR, Gaziantep – Mercy Corps, International Medical Corps (IMC), Support to Life (STL) and Association for Solidarity of Asylum Seekers & Migrants (ASAM). They were distributed during the New Year celebration on January 1, 2016. The feedback videos and picture came through, so did the testimonials. It was nothing short of inspiring to see how these children leaped with joy holding up their Letters of Love from their new friends. You can see it here! 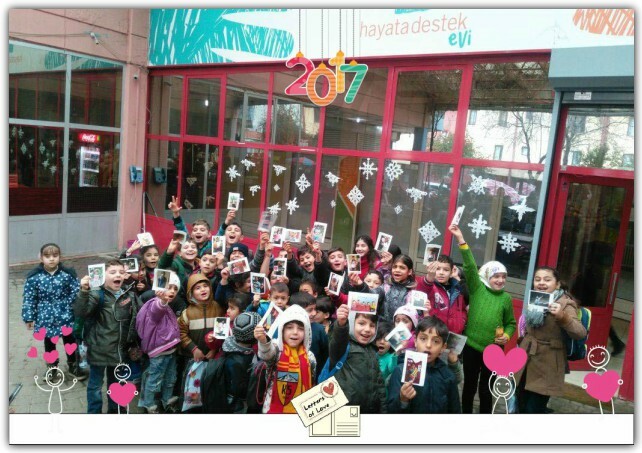 Syrian children attending activities in STL Narlica Community Centre, Gaziantep Malumat Community Centre and 7 ASAM/IMC Centres (Adana, Gaziantep Yesilsu and Karsiyaka, Istanbul Tarlabasi and Fatih, Izmir, Sakarya) received the letters in 2016. As a testimony to the fact that ‘Happiness is Contagious’, we received requests from Yazidi & Iraqi refugee community centres. 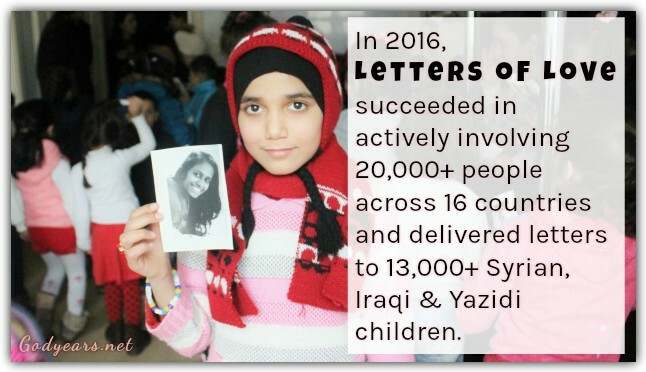 Letters of Love in its subsequent year succeeded in actively involving 20,000+ people across 16 countries and was able to deliver letters to 13,000+ Syrian, Iraqi & Yazidi and sensitise around 5000+ students. We’re on our 3rd year now and the response is just overwhelming with love and enthusiasm to make a difference with whatever we can, with whatever we have, wherever we are. I know thousands of children would want to thank you for what you do for them. What is the best moment you've had during these last few years? An 8th grader from Alaska wrote me an email through her Mom's account after finding my email ID by pinging around 10 people I've worked with. 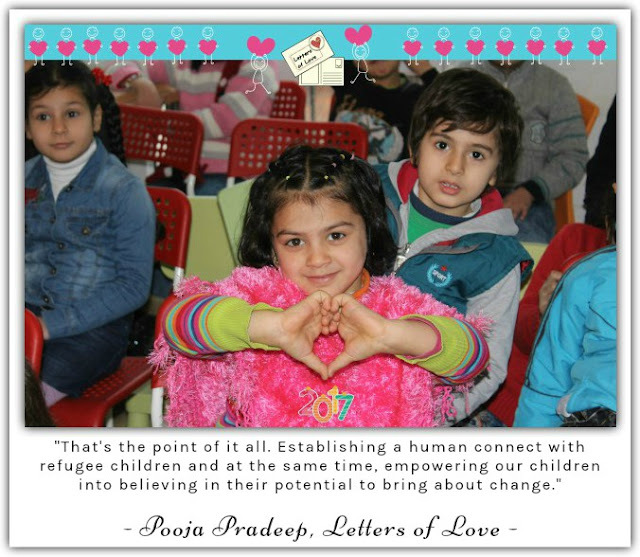 'Dear Ms.Pooja , I want to make a difference to Syrian refugee children and help them smile and feel belonged. I’ve already collected 200 letters in the past year. I don’t know which address to send them to. Could you please help me find a way? ', was the gist of her email. That's the point of it all. Establishing a human connect with refugee children and at the same time, empowering our children into believing in their potential to bring about change. Reading this 13 year old’s email is one of my favourite moments, apart from seeing the happiness spread to the refugee children because of these letters. Books - Pollyanna by Eleanor.H.Porter is a book that has moulded me as a person. Food - Biriyani- Always and forever. What about recent developments for Letters of Love? Apart from delivering letters to Syrian, Iraqi & Yazidi children, we're also collaborating with Azaad Pakistan & Human Relief Foundation and will be delivering to Rohingya refugee children in Bangladesh. Collaborating with Y-Peer, a youth organisation in Palestine, we're delivering letters to Palestinian refugee children in Gaza and West Bank as well. We're piloting our Pen Pal Project this year where around 500 children under Clap Global, an educational intervention that leverages foreign travellers to interact in local classrooms, will be writing to war child victims in Syria and Gaza as well as refugee children in Turkey and these children will be writing back to their newly made friends in India. For Letters of Love 2018, how can we help you? You can send in your 'best smile and funny face' letter here. You could help us send letters by donating humbly here. 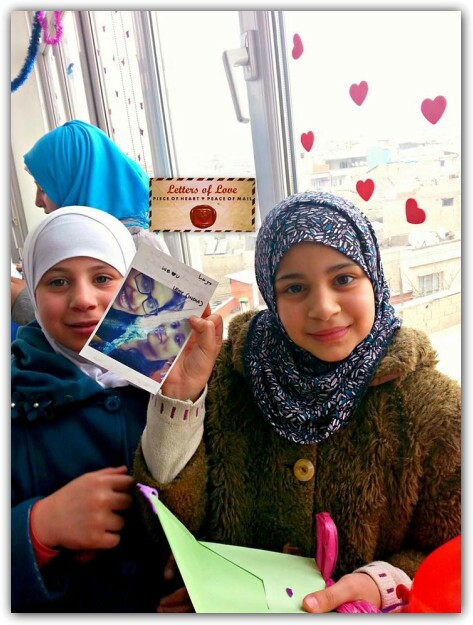 To get involved with us in a larger way, you can visit www.lettersoflove.in and send us an email. 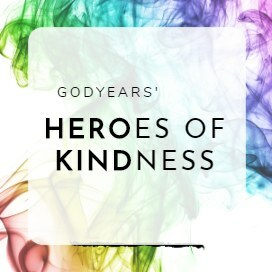 In 2017, I began compiling a list of Real-life Heroes of Kindness and Compassion. 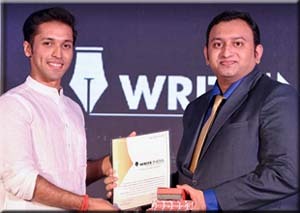 In my mind, there is no doubt that Pooja Pradeep and the team at Letters of Love deserve to be in this list. I'm tagging this post to the #WATWB initiative where bloggers from across the world aim to share inspiring and happy posts on the last Friday of every month. You can read more feel-good posts (and also add your own, if you want to share the joy with #WATWB) in the linky here. 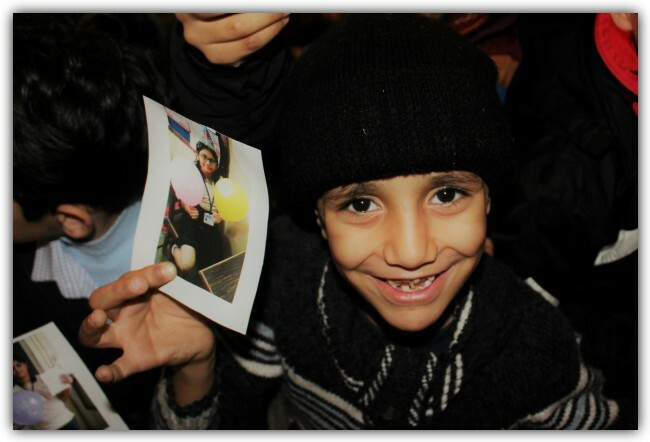 Have a photo of your wonderful smile you would like to share to bring happiness to a victim of war? You can send it right now to Letters of Love here. It will only take a minute for you but it really does make a world of difference to a child who feels the world has forgotten him/her. That's great to know about the happiness Pooja brought to many refugees. Nice idea and great effort of Pooja to implement it. I've been sending for the past 3 years. Regularly push others to do the same. 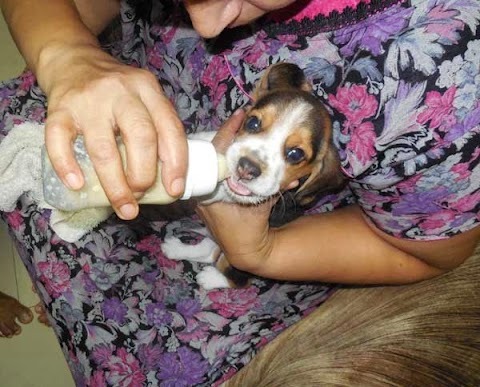 That is such a beautiful story, full of hope and warmth and lots of love! Kudos to Pooja! I did send one last year. It's such a lovely thought. Hats off to this young lady! 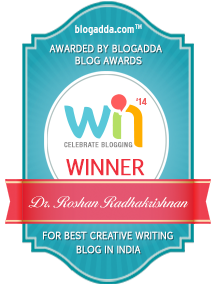 Thanks Dr Roshan, truly lovely post. You can see the joy in those little ones' faces holding up their letters of love! I'll try to get one off as well! Inspiring story, thank you for sharing with the readers. This sure is a great initiative and the idea of spreading smiles among people is always novel. Hopefully we will have many more such initiatives. This is so kind act. I am glad someone is doing it for the needy. With the current state of the world, the children of refugee have a very uncertain future unless someone helps them. What an amazing effort and considerate work done by Pooja! I’m definitely going to do my little bit, of whatever I can! SO good to know about her. I love your series Roshan - so many great people around! You just need a simple thought that provokes your idea. And before you realise something unusual and helpful has taken its existence.